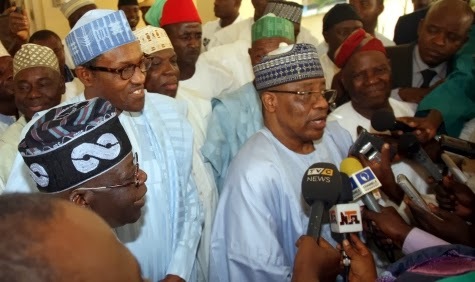 The leaders of APC party (All Progressive Congress) yesterday paid a courtesy visit to ex-military ruler, Ibrahim Babangida aka IBB in Minna. The alleged sponsor of Boko Haram terrorist group was made a star yesterday at his hilltop mansion in Minna, Niger state. The day APC leaders made dreaded IBB a star. 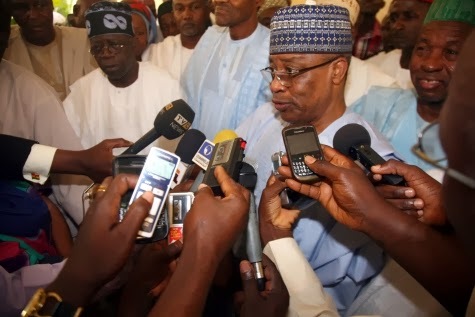 Sources claim the APC party officials went on a desperate mission to seek Mr. Babangida’s support for the new political party. 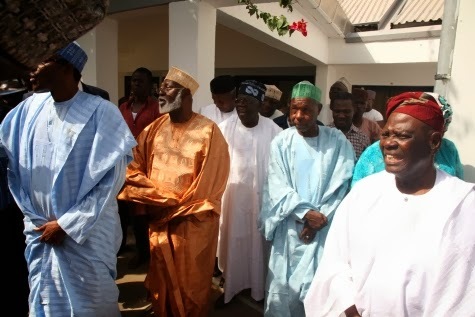 The leaders were led by Bola Tinubu, who spent some time in exile for fighting against IBB’s annulment of June 12, 93 Presidential election. Here are more photos from the visit. Desperate things Nigerian politicians do for power part 1. Tibunu of all people should know more than this. Our so called Yoruba leaders have not learnt their lesson from Abiola and Awo that the North, especially the arrogant Fulanis, will not share power. I wonder why people will forget so soon what Buhari and IBB did to us in the South West. It is a shame indeed. I think it’s time a more forceful and purposeful leadership emerge in the SW, NO PDP PLEASE!!. I do not think for one minute that it makes sense to go with Buhari and it is beyond my imagination that a true Yoruba man will want to do politics with IBB. I think someone should explain this to me. 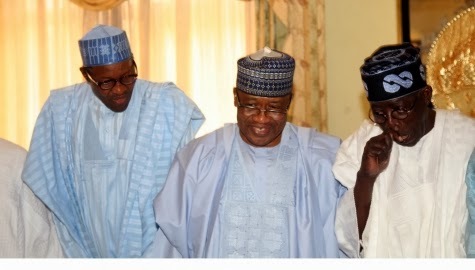 Besides the betrayal of June 12, why would anybody with sense of integrity want to associate with IBB? It is time people call to question Baba Akande and Tinubu moral integrity. The same Buhari who claims to be anti-corruption has gone to Minna to prostrate before Babangida, the undisputed Grand Wizard of modern day corruption. We from the South-South and our Brothers from the South-East are ready. If Nigeria breaks up tomorrow we are not the ones that will suffer because we have all the Oil and Gas. The North has ruled Nigeria for 38 out of the 53 yrs of our independence, and the 3 years that a South-southerner has been President is what is now giving them hypertension. President Jonathan will occupy the Villa until 2019, if you’re not happy about it then let Nigeria Divide, so that Buhari can become President of Sokoto, since he cannot live unless he becomes President of something. Waste of space. IBB sure has his reserved space in hell heated up to the degrees of my Naira he has stolen. Notably the $12.7m SS oil money that “disappeared with no trace”, as Ras Kimono rightly put in his hit song of the 90s. But in all of his evil, there is one action on which IBB and I agree, his refusal to hand over power to a thief. It was MKO who started billion Naira fraud in continent Nigeria. 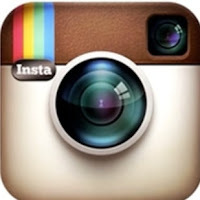 It was the ITT fraud done in conjunction with OBJ & the military rulers of the day. IBB knew this quite well…and MKO became a billionaire overnight. Greater South East (South South and South East) 2015-2023. Middle Belt (Current North Central) 2023-2031. North (Current North West and North East) 2039-2047. The PDP with any candidate will not be able to rig the 2015 Presidential election against APC candidate of Greater South East (SS and SE). At these times, only a progressive candidate under the APC from this area shall be able to put the country on a formidable foundation and structure. All the APC national convention delegates should nominate their 2015 APC Presidential candidate from Greater South East (SS&SE). APC is nothing but a joke. The man that said that APC is nothing but an obsolete medicine was very right. It behooves me to see that the like of Buhari whom i have a grate deal of respect for is losing his dignity and integrity out of desperation to win 2015 election from any angle victory may emerge from. He is now friend to a heartless destroyer of Nigeria that is not good to be alive, the so called evil genius known as Ibrahim Babangida. May the Creator punish all of them for the poor masses of Nigerians. I am sick to my stomach….I am out of words. My fellow countrymen/women, please be prepared for the worse in the coming years. Nigeria will soon collapse. May any corrupt Nigeria leader died in plane crash, becuase Nigerians deserve something better life, also pray for boldness of Lybians, Tunsians and Egyptians to fight aganist corrupt leaders in this great country of ours. There is no lesson for future leaders against coruption, we have to start from a point, run to other country is not solution. Placing fear of corruption into the leadership in governemnt is the solution. 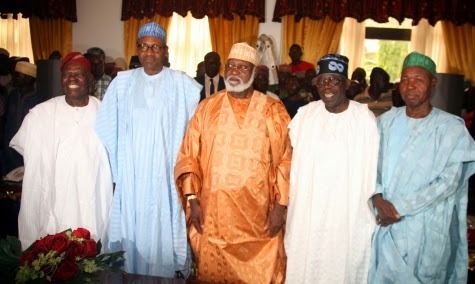 These aimless OLD leaders should forgive Nigeria if we have offended them, this ceaseless torturous pictures meen! Please GOD handsomely destroy our enemies amen. all are same devil with bolld money and want to die in power,this time we need Amry back not white clothes political party that thief with pen in office. 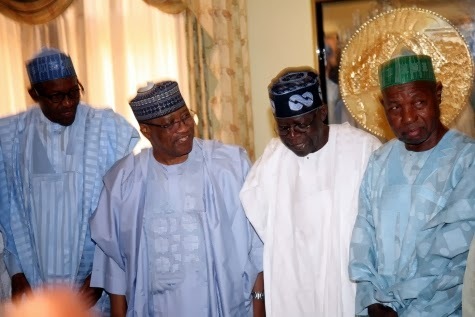 Maybe Tinubu was promised something for him to help to scuttle June 12. Talking about Judas Iscariot here! Maybe he supposes it’s time to pay him back. I pity him though. This is a gang of men, who thinks power is the sole right of a given few. This is a political cult with men who know nothing about leadership without prejudice and bias. These are men who think the populace are stupid and blind. These are men who equate being cunning, cleverness and intelligence. These are men hungry for power and relevance at all cost. These are unscrupulous tyrants who are slaves to the trickle-down theory but hardly practice same once they grab. These are men who injected their decay-inducing serum on the substrate they called Nigeria. These are faces signifying assassinations, killings, massive hunger and reckless austerity, nepotism, discrimination, staunch haters of anything, and anybody, from Eastern naija. 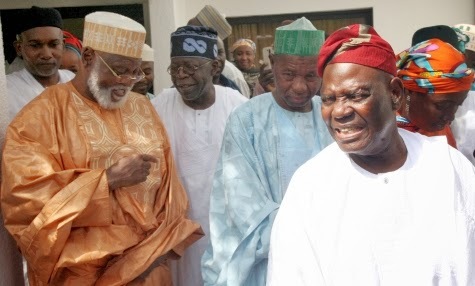 These are selfish and wicked people (together with their ilk – Useni & Gowon et al,) with always smiley faces for the camera but whose only success is the conversion of our beloved country into a jungle and a pit. Pity! pity!! pity!!! He frustrates the devices of the crafty, so that their hands achieve no success.